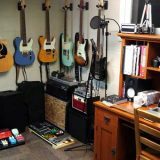 Setting up a basic guitar recording setup is something you’ll make great use of whether you write your own songs, enjoy jamming, want to record some covers or even to analyze your playing and practice. There are so many options out there today for recording guitar at home so in this guide, we’ll cover the basics to get you going. By the end of this guide, you will know exactly what you need to record your guitar to PC. 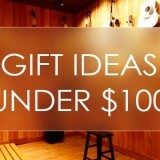 You will also be able to choose the best options for you from the most popular gear available. This guide will only cover PC as I don’t have a Mac. But if you have a Mac, you will find that almost all options still apply to you. You’ve likely seen plenty of photos of recording studios with racks, monitors, and gear everywhere. They can look overwhelming as well as impressive. In the past, going to a professional recording studio was the only way to produce high-quality recordings. Today the truth is you can achieve the same quality (or higher in some cases) recordings at home on a very basic setup. Thanks to massive improvements in technology, high-quality recording gear is now very affordable. You can start recording high-quality guitar tracks with only a few extra pieces of gear. Pretty simple, right? All you need is a way to plug your guitar into your PC (or a microphone for acoustic guitar) and software to record. The rest of this guide will take a close look at each component as well as which options to consider. If you have all the equipment you need, check out my tutorial on recording your first song. There are alternatives to the recommended gear above, so read through the rest of the guide for full details. The first piece of gear you need to consider is what you will use to connect your electric guitar to your PC. If you might need to record an acoustic guitar, skip to the next section. This section will look at options suitable for electric guitarists. If you might need to record vocals, other instruments or acoustic guitar in the future, have a look at the next section. To connect your guitar to your PC, you need an ‘audio interface’. These used to be large expensive units and didn’t produce a good quality signal. Today you can pick up a high-quality audio interface for under $100 that’s significantly better than units worth thousands in previous years. It’s worth mentioning that you will also see audio interfaces going ridiculously cheap (like $10). I highly recommend avoiding anything that cheap. When the first iRig came out, a lot of people got sucked in by cheap Chinese copies on eBay only to get frustrated when they didn’t work. Get a good quality audio interface – it’s worth paying a bit more to ensure you get a good quality unit. The option I recommend for electric guitarists is the iRig HD 2 by IK Multimedia. It’s a tiny unit and is compatible with PC, Mac, iPhone & iPad. It records at a 96kHz sampling rate with 24-bit A/D conversion which is the highest available in consumer devices today. The main reason I recommend the iRig HD 2 over other devices with similar features is that it also comes with the full version of AmpliTube 4 (PC/Mac) and AmpliTube for iOS (iPhone/iPad) for free. This is great because as you will see later, having software like AmpliTube gives you so much flexibility with your recordings. When you consider that AmpliTube 4 costs around $150, it’s a great deal. Of course there are plenty of alternatives, but if your focus is on electric guitar, I recommend getting the iRig HD 2. The only times I don’t recommend the iRig HD 2 for electric guitarists is when you want to record other instruments as well (eg: acoustic guitar, drums, piano, etc.) or you want to record your guitar amp via microphone. The iRig allows you to connect your guitar to your PC, so if you instead want to mic up your amp, consider the options below instead. 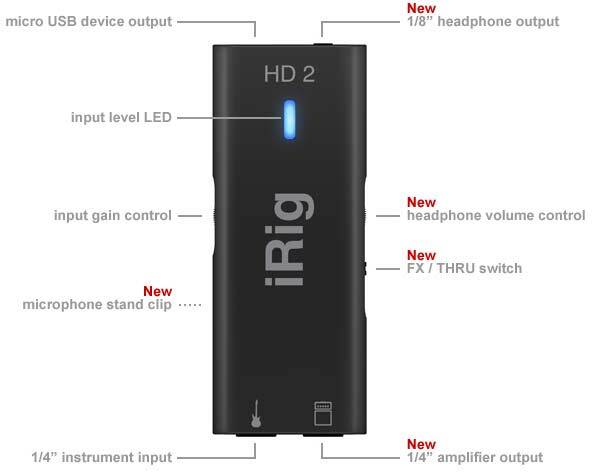 Find out more on the iRig HD 2 in my review here. If you plan on recording acoustic guitar or you play both acoustic and electric or you want to record vocals as well, you will need an audio interface that gives you multiple inputs. There are plenty of options if you want multiple inputs, but I’ll keep things simple and recommend one of the most popular and highly rated audio interfaces. As you can see below, the Focusrite Scarlett Solo gives you more flexibility with inputs compared to the iRig HD 2 above. This means you can record anything via microphone, electric guitar with the line in or other line-level instruments such as keyboards. If you plan on recording acoustic guitar, I recommend buying an audio interface that allows you to record at least 2 microphones at the same time. This will mean you can record one microphone up close and one at a distance to get two different sounds from the same performance. Then you can mix between the two to achieve a tone you prefer. Being able to record multiple inputs also means you can play and sing at the same time and capture both at once. There are larger units if you want more inputs such as the Focusrite Scarlett 2i2 (2x the inputs) or the Focusrite Scarlett 2i4 (4x the inputs). If you do buy one of these units, make sure it’s second generation (like the ones I’ve linked to) and not the first generation. The second generation has better quality preamps and converters. These units also come with a Lite version of Pro Tools and Ableton Live Lite, so it does give you software to get started recording straight away. But as you will read later, most Lite versions won’t give you the features you will want. While I recommend getting a dedicated audio interface, there are alternatives. Many modern amps and multi-effects units can be used as an audio interface. For example, if you have a Line 6 amp or pedalboard, you will see a USB port on it. Plug it into your PC and you’re good to go. One benefit of using your existing gear as an audio interface is that you can record the tones and effects you already play directly into the DAW. So if you have a preset on your multi-effects pedal you want to use in your recording, use the pedal as your audio interface. If you only plan on playing electric guitar and will plug your guitar directly into your audio interface, you won’t need a microphone. But if you plan on recording your amp, other instruments, acoustic guitar or vocals, you’ll want a microphone (and an audio interface with microphone input). There are countless microphones available today and quite a few different types. As this guide is meant for beginners, I’m not going to talk about the pros and cons of dynamic vs condenser microphones or anything else on mic types. Instead, I’m going to suggest one microphone to get you started, the Shure SM57. The chances are you have heard of it. It’s the most well-known microphone to guitarists and can be found in every studio. 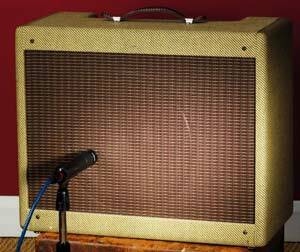 For many guitarists, it’s the gold standard for recording a guitar amp. But it also works very well for other instruments and vocals. For a beginner recording at home, this is the perfect microphone. Fortunately, it’s really cheap so even if you don’t plan on recording much with a microphone, I recommend getting one. At some point, you may want to buy another microphone more suited for acoustic guitar or other instruments, but the SM57 will always be useful so it’s a worthwhile investment. Once you have an audio interface set up to connect your guitar (or a microphone) to your PC, you will need a DAW. A DAW – Digital Audio Workstation – can be thought of as an entire recording studio in one software program. You know those massive mixing boards you see in all studios? In a sense, a DAW gives you a virtual version of that. So you won’t need massive mixing boards to record and mix multiple instruments and tracks, you just need a DAW. I know the above screenshot can look overwhelming, but it won’t take you long to learn how to use any DAW. There are a few popular options available and each one I’ve listed below has a strong following which means there are plenty of tutorials on YouTube. You may be wondering what is the best DAW, but the reality is there isn’t one. Each one gives you a different layout and experience so it’s comparing apples and oranges when comparing different DAWs. Many people will swear by a certain DAW, but it depends what type of music you want to create and how you want to use it. Before looking at the most popular DAWs available today, it’s important to point out that each option has a ‘Lite’ version. A Lite version is basically a watered down version of the full DAW. They usually limit the number of tracks you can record, limit the effects you can use and may even stop you from using any plugins. You will likely regret spending money on a Lite version. Most audio interfaces will include a Lite version of a DAW, so it’s a good way to try a DAW out before buying the full version. You’ve probably heard of Pro Tools before. In the past, it was the gold standard and many artists still feel that way today. While a lot of high profile artists may use Pro Tools, I don’t really feel it’s as good as other DAWs for home guitarists. I have tried Pro Tools in the past and I don’t recommend it. It feels clunky and feels like a remnant of the past. One of my students had a hard time with the iLok (a security device that unlocks the software) which meant he couldn’t even use the software. Unless you have a specific reason to use Pro Tools, I recommend any other DAW listed below. The only reason I’m including it here is that everybody has heard of it. Studio One is fairly new compared to other DAWs. The maker of Studio One, PreSonus, also makes audio interfaces. They originally created Studio One to sell more audio interfaces. 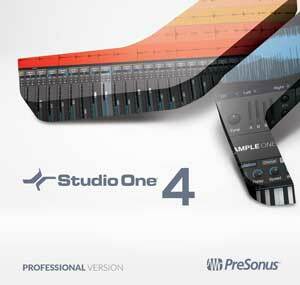 As of writing Studio One is in version 4 and is just as powerful as any other DAW that has been around for decades. I recommend Studio One as your first choice for a DAW because it feels like it has been developed by guitarists rather than electronic music people. That’s important because the types of features you will want as a guitarist won’t appeal to somebody wanting to produce electronic music. It’s why I generally don’t recommend Ableton Live for guitarists because it was designed for DJs. I switched to Studio One as my main DAW after many years using Cakewalk Sonar and it’s been fantastic. In my opinion, it’s one of the easiest DAWs to learn. If you feel overwhelmed when you see screenshots or videos of different DAWs in action, Studio One is quite easy to get the hang of. I also love the ‘scratch pads’ which is an easy way to experiment with different riffs or rearranging a song. If you buy Studio One, make sure you don’t get the ‘Artist’ version. It’s a Lite version that cuts out the most important feature – plugins. It might look like a great way to save money, but it’s not worth it. Make sure you get the Professional version and get version 4 (or higher if available). 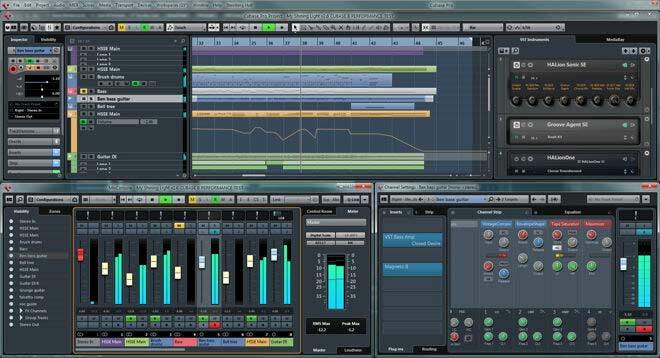 Cubase is possibly the most popular DAW for musicians focused on audio rather than MIDI. It has been in development for a long time and has evolved to an extremely powerful DAW. I don’t use Cubase because I prefer Studio One’s layout and tools, but many guitarists swear by Cubase. It is the most expensive option I’ve covered here, so unless there’s a specific reason why you prefer Cubase, I still recommend Studio One. Be careful if you get the Artist version as it may not contain the features you want. I wouldn’t even consider the Elements version. FL Studio was originally called Fruity Loops and was popular with beatmakers as at the time it didn’t record audio at all. It eventually evolved into a full DAW with audio recording and exploded in popularity. It’s now one of the most popular DAW but still has a massive following in the electronic music circle. I personally use FL Studio as a way to experiment and come up with song ideas. As FL Studio was originally meant for beat creation, its step sequencers and loops makes it easy to come up with drum parts for riffs as well as loop and move riffs around to work on structuring a song. FL Studio may not be the best choice for beginners or people who want to record straightforward guitar-based music. But, if you like the idea of mixing loops and beat creation with your guitar, it’s great fun to use. Ableton Live – this is an extremely popular DAW for electronic music. It’s radically different to other DAWs and designed for DJs and live performers. While you could use it as a guitarist and some guitarists do, I recommend a more traditional DAW. But if you’re a live performer who experiments with loopers for layering, you might want to consider Ableton Live. Logic Pro – while this guide is for recording guitar on PC, it’s worth mentioning for any Mac users reading this that a very popular Mac-only option is available. I don’t have a Mac so I can’t talk about it, so check out Logic Pro here. Cakewalk Sonar – I used to use this DAW for quite a few years before switching to Studio One. I’m sure it’s made a lot of improvements since last time I’ve used it, but I doubt it’s at the same level as Studio One or Cubase. Once you have your audio interface and DAW set up, you’re ready to start recording. But unless you connect your amp to your audio interface, you’re only going to be recording a dry signal. Fortunately, there are countless plugins you can use to craft the perfect guitar tone. Let’s look at some of the essentials to consider. The plugins below are ‘VST’ plugins and your DAW needs to be able to use VST plugins for them to work. This is why most Lite or Artist versions of DAWs aren’t worth your time because they usually don’t allow VSTs. The most valuable type of plugin for you as a guitarist will be one that allows you to shape your tone with amp & effects models. 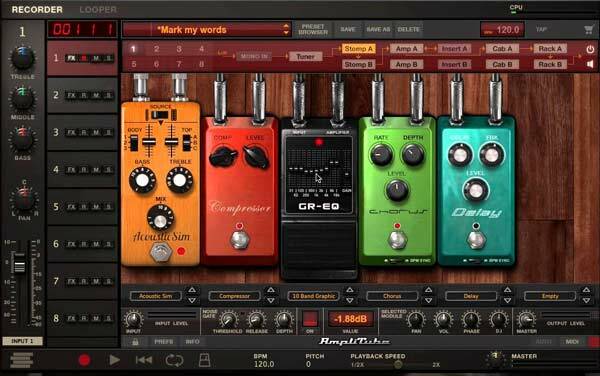 These plugins allow you to record a dry signal from your guitar, then set up any type of amp and effects rig you want. It’s ridiculously easy to achieve high-quality tones for your recordings with any of the most popular modelling plugins. 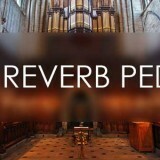 If you buy the iRig HD 2, you receive AmpliTube 4 in full for free. Otherwise, the best way to figure out which plugin suits you the best is to download the demos for all three and try each one out. You’ll quickly get a feel for which one you prefer. Out of all three listed above, BIAS FX is regarded as the highest quality plugin. Guitar Rig 5 is the oldest so it is starting to fall behind other plugins. I’m looking forward to Guitar Rig 6, but there’s no word on when that is due out. AmpliTube 4 is fairly new and stepped the quality up quite a bit from AmpliTube 3. Find out more about AmpliTube 4 in my review here. There are plenty of other alternatives when it comes to amp and effects modelling. For example, your guitar amp or multi-effects pedal may include software you can plug into your DAW. For example, some Line 6 multi-effects pedals include software like POD Farm, which works like AmpliTube. The quality of any drums you use will make or break your recording. Nothing screams ‘amateur’ more than poorly recorded drums. If you don’t have a drummer to use in your recordings or you want super high quality sounding drums, you’re in luck. There are quite a few ‘virtual instruments’ available with high-quality samples of drum kits. Basically what these virtual instruments do is play whatever you want. In the DAW, you simply enter in the drum beats and fills in a track, and you will hear a realistic sounding drum kit play it. The good plugins will sound just like a real drummer on a real kit. 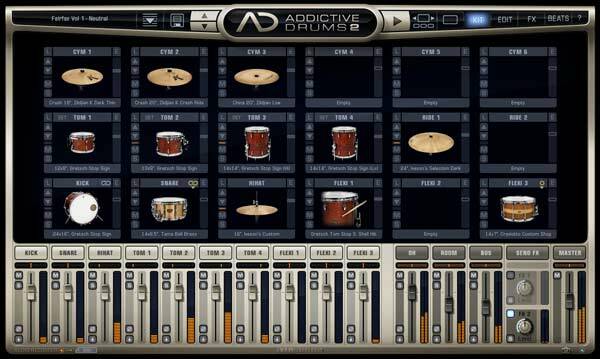 The most popular options are Addictive Drums 2 and Toontrack EZdrummer 2. They’re expensive, but the quality is amazing. Have a listen to demos on YouTube to get a better idea on what they’re like. The speakers or headphones you use when mixing your recordings will play an important role in the end result. The reason professional musicians and sound engineers specifically use studio monitors is that regular speakers or headphones add too much color to the sound. Most consumer headphones completely change the tone you hear to make it sound more impressive. They usually increase the bass, cut some of the mids and raise some higher frequencies to make music sound different. When you mix a song in a studio, you don’t want to hear an ‘enhanced’ version through your speakers or else you won’t mix the song properly. If your speakers add bass to what you’re hearing, if you mix the song then listen to it on different speakers, you’re likely to be disappointed with the results. A good set of studio monitors will ensure you hear the ‘real deal’. Choosing a good studio monitor is a big topic that causes a lot of heated arguments among audiophiles. If you thought guitarists argue a lot over guitar amps, it’s significantly worse with studio monitors. So to avoid getting a constant stream of emails telling me off, I’m simply going to recommend the monitors that were recommended to me. 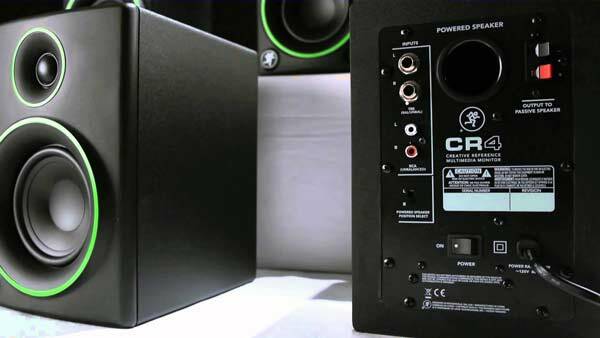 The Mackie CR series is incredibly popular and praised for their quality at a very good price. When you consider that some people pay thousands for monitors, these are a steal for the quality you get. The series offers 3″, 4″ & 5″ monitors at 50 watts. Two of the models (CR4BT & CR5BT) also offer Bluetooth streaming. If you will be recording acoustic guitar, vocals or any other instrument with a microphone, you will need some good quality headphones. Just like monitors, headphones is a touchy topic as everybody seems to have a different opinion on which headphones are the best. If you already have headphones, it’s up to you whether you feel like an upgrade would be worthwhile or not. My recommendation if you already have a good set of headphones is to invest in some good monitors to use when you’re not actually recording. 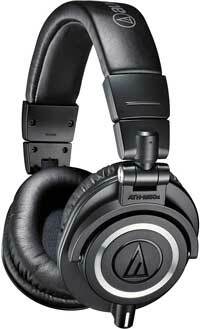 The top-rated studio headphones on Amazon at the moment are the Audio-Technica ATH-M50x as shown to the right. They’re rated overwhelmingly positive so if you’re after the best, these will probably suit you. Alternatively, the Sony MDR7506 are just as popular and a bit cheaper. Either option will likely be a big upgrade from typical headphones, but whether it’s worth the upgrade is up to you. So you’ve now got all the hardware and software you need for your home recording studio, now what? First I recommend going through my Tutorial on Recording Your First Song at Home. The tutorial will show you how to get started with all the above equipment and software so you can record a full song with all instruments. This is a good way to get the feel for using the DAW and your equipment. Pick a song you know well and load the song into the DAW. Then create a new track, set up the amp tone you want and record yourself playing along with the original. If there are multiple guitar tracks in the song, create multiple tracks in your DAW and record each part. If you have a bass guitar, try recording that on another track. After you record all your parts, mute the original track and hit play. Now you can experiment with mixing your guitar tracks, adjusting the tone and effects and possibly add the drum tracks if you have a plugin such as Addictive Drums or EZdrummer. Learning how to write a song from within the DAW is a great skill to develop. Not only will it help you come up with creative ideas and quickly put songs together, but you can easily save any ideas you come up with for the future. You will never have to worry about forgetting a great riff or idea again as you will be able to record and save everything. Record a riff or chord progression and copy and paste the idea over and over so it loops. Now you can practice coming up with solos, lead lines, melodies or other riffs over the top of your idea. Record your ideas and keep layering more ideas. After a bit of practice, you’ll get the hang of it and will start coming up with really interesting ideas for songs. Once you get the hang of recording guitar using a DAW, ask another musician to come in and record something. This will teach you a lot about other instruments, mixing and editing. If you know somebody who sings, prepare a backing track before they come in. Practice editing the track using multiple takes, try recording harmonies and backup vocals and use effects such as reverb to make the vocals shine. Not only is it a lot of fun recording other musicians, but you will learn so much from the experience. Reach out to as many different musicians as you can and learn how to make each type of instrument sound great. The more you understand how different guitar effects work and how they interact with each other, the easier it will be to create the tones and sounds you want. 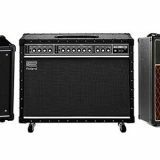 This guitar effects course digs deep into all common types of guitar effects, how they work and how to use them. Check it out if you’re interested in learning more about guitar effects. Get updates on any guides, reviews, and lessons relating to using your home recording gear by subscribing to email updates. I’ll be covering a lot of topics related to recording at home in the future, so if you found this guide useful, subscribe to get more tips and advice.